Take the stress out of gift-giving with an organized closet of wrapping supplies. When there’s a looming holiday or birthday on your calendar, the pressure to find the perfect gift is constantly on your mind. Or even worse, is the forgotten event that causes you to scramble for a present at the last minute. No matter the gift-giving scenario, one thing is certain – once you buy it, you need to wrap it. Uh oh, you forgot to get a gift bag. Now begins the mad dash through your house searching for gift wrap or a decent bag. Once again you can only find Santa-themed wrap, and it happens to be July. Sound familiar? 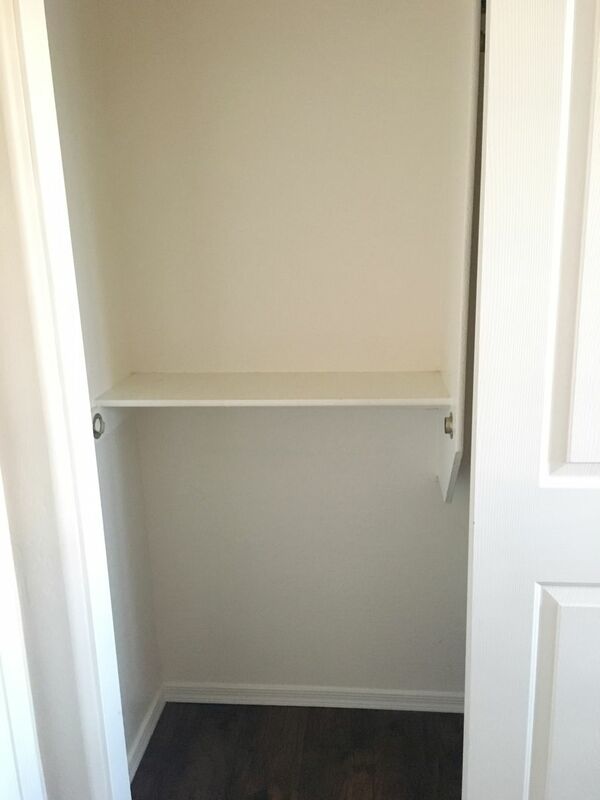 We’ve got a solution for you, and all it takes is an empty closet. 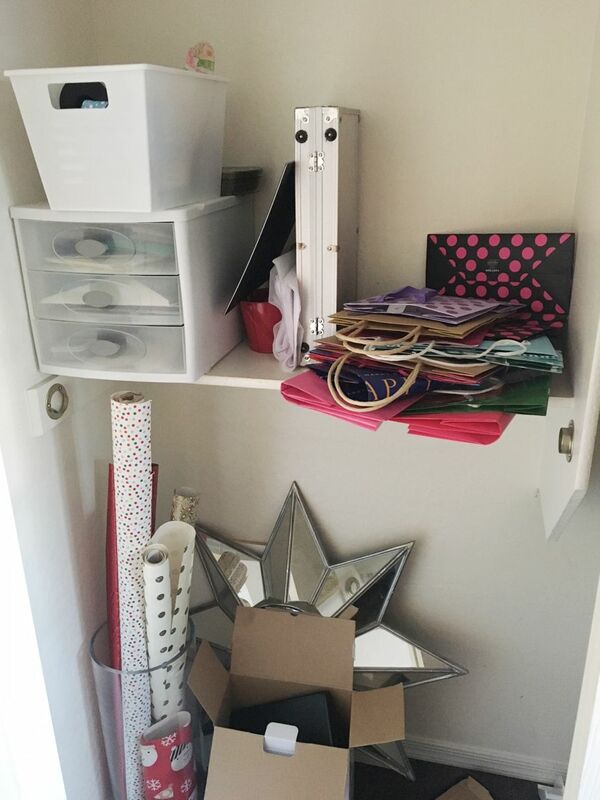 Here are a few simple steps for creating an organized gift wrap closet. 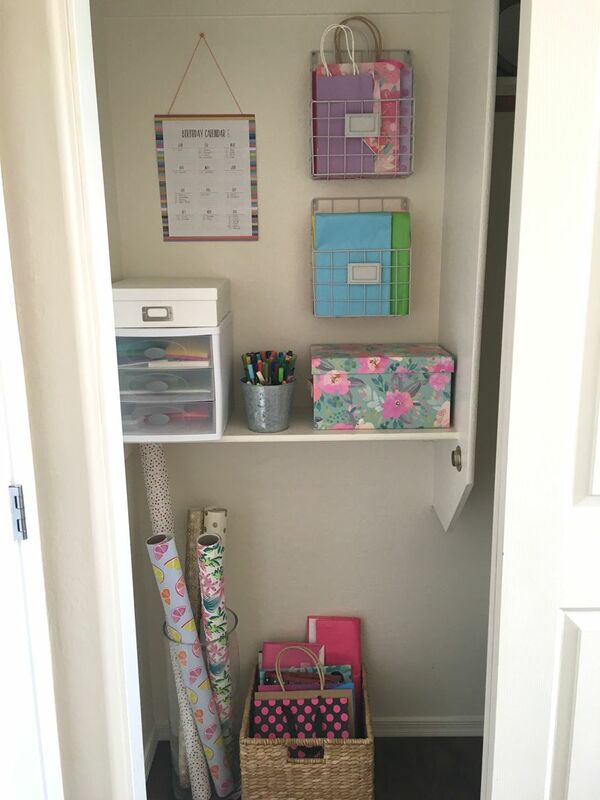 Empty the closet of all of its contents and start with a blank slate. Clean any shelves with a damp cloth. Now it’s time to choose what goes back. Remove anything unrelated to gift giving. Keep the supplies you use every time you wrap a present, including gift wrap, gift bags, tissue paper, cards, envelopes, gift tags, pens, tape, and scissors to name a few. A long list isn’t it? That’s exactly why the gift wrap closet is so essential! You don’t need to spend a fortune on organizers to keep your supply stash tidy. But a few well-chosen items will make all the difference. A large, tall vase is the perfect vessel for rolls of gift wrap. For larger gift bags, line them neatly in a basket. For gift-giving emergencies, it’s nice to have a stash of cards already on hand so you don’t have to run to the store. 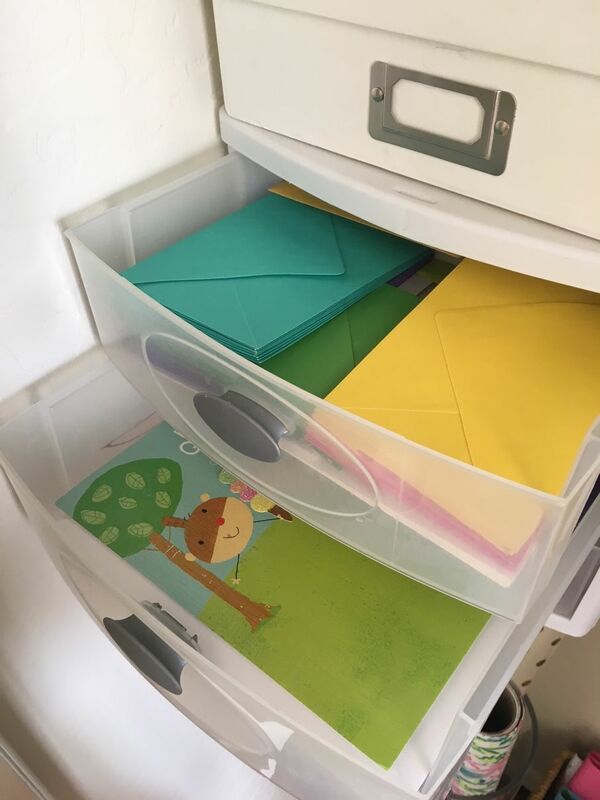 Store a variety of cards for different occasions, as well as blank cards in a plastic drawer unit. 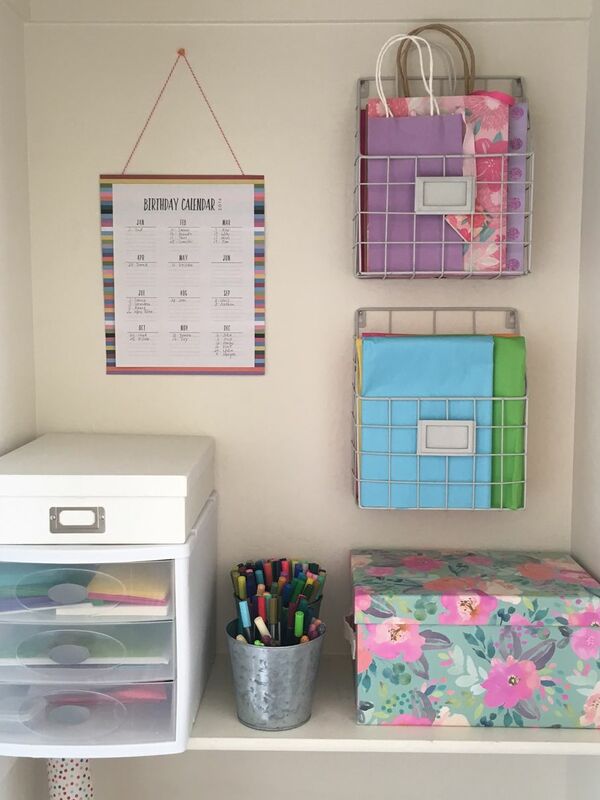 You can also use one of the drawers for scissors and tape. Don’t forget to think vertically when it comes to organizing. Don’t waste all that blank wall space – use it! A couple of wall-mounted baskets can hold smaller gift bags and colored tissue paper. We know Facebook keeps you in the know when it comes to birthdays, but it can be good to plan with a good old fashioned calendar. 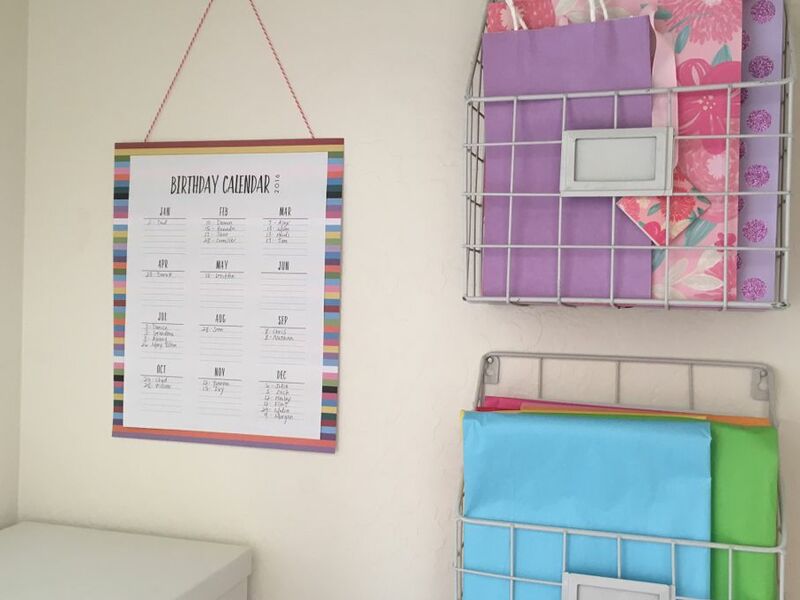 Print out a simple calendar and hang it in your gift wrap closet. A calendar makes it easy to look ahead and see what present or card you need to send out next. 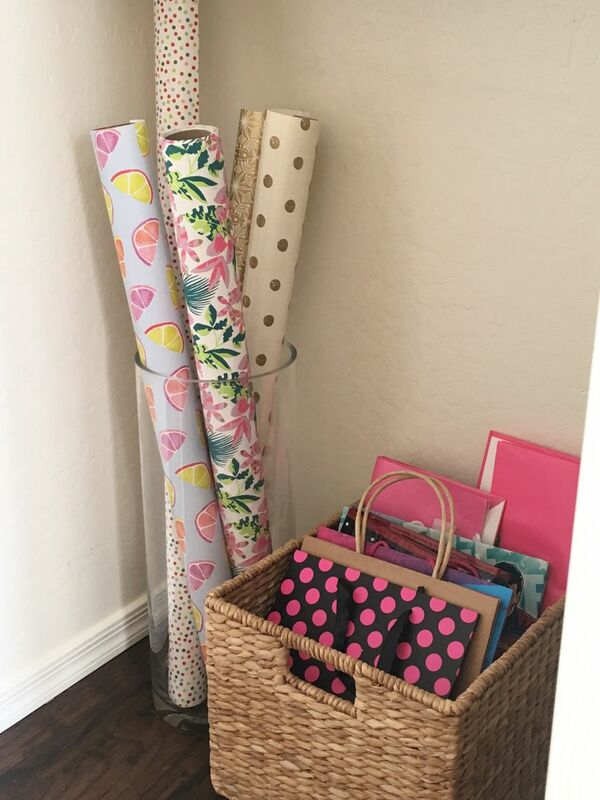 A gift wrap closet is convenient, useful, and oh so pretty! Knowing that you always have the right supplies at your fingertips makes gift-giving much easier. Plus, when you see a killer gift wrap sale you can stock up. You’ll know exactly where to put it when you get home.